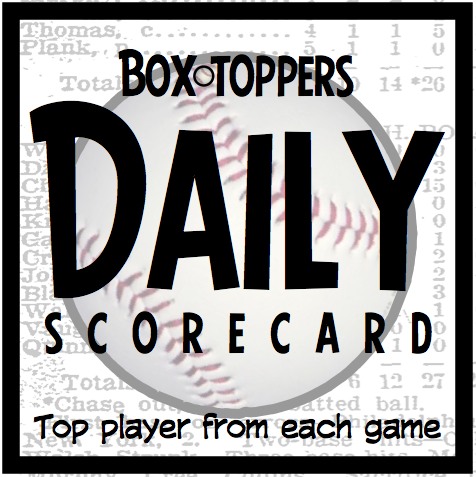 Pirates pitcher Joe Musgrove is Friday’s Box-Toppers Player of the Day. Musgrove struck out eight over seven scoreless innings, allowing three hits and one walk, in the 2-0 win over the Reds. Here are the top 10 players in Box-Toppers points (BTP) for the 2019 season through the games of April 5. Musgrove earns 2.0 Box-Toppers points for being Player of the Day, his first points of the season. He ranks 15th in Box-Toppers season player rankings, highest among all of Friday’s Player of the Game winners. American League Player of the Day—Rays pitcher Tyler Glasnow struck out six over six scoreless innings, allowing three hits and one walk, in the 5-2 win over the Giants. American League Batter of the Day—Tim Anderson of the White Sox homered and went 3-for-4, scoring four times and driving in three runs, in the 10-8 win over the Mariners. National League Batter of the Day—Orlando Arcia of the Brewers homered and went 3-for-3, scoring three times and driving in two runs, in the 13-10 win over the Cubs. Scoring—Musgrove earns 2.0 Box-Toppers points for being Player of the Day and Glasnow earns 1.7 points for being AL Player of the Day. Anderson and Arcia each earn 1.5 points for being their league’s Batter of the Day. All of Friday’s other Players of the Game (listed in the chart below) earn 1.0 Box-Toppers point.